These daylilies are nothing to exclaim over by any means. 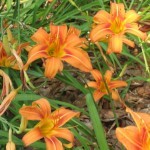 In fact, the tawny Hemerocallis fulva is shunned by most daylily “snobs” because it is considered common. You find them along country roads and ditches, in cemeteries, and beside rural homes. And that’s exactly from where these came! My sister and I dug these up from an abandoned homesite that belonged to our ancestors a century ago. 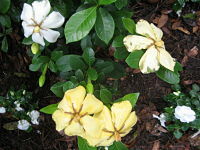 For me, where these came from is more significant than the “exoticism”, if you will, of the actual plant. Old Orange is a connection to my past and from whence I came. Our family has a weekend house in the Alabama country where we spend alot of time. It is where my parents, grandparents, and great grandparents lived and died. Hence, my strong connection to this place called Boligee. I guess that’s what we call “having roots” means. Anyway, my sister and I transplanted these daylilies years ago to our weekend home. 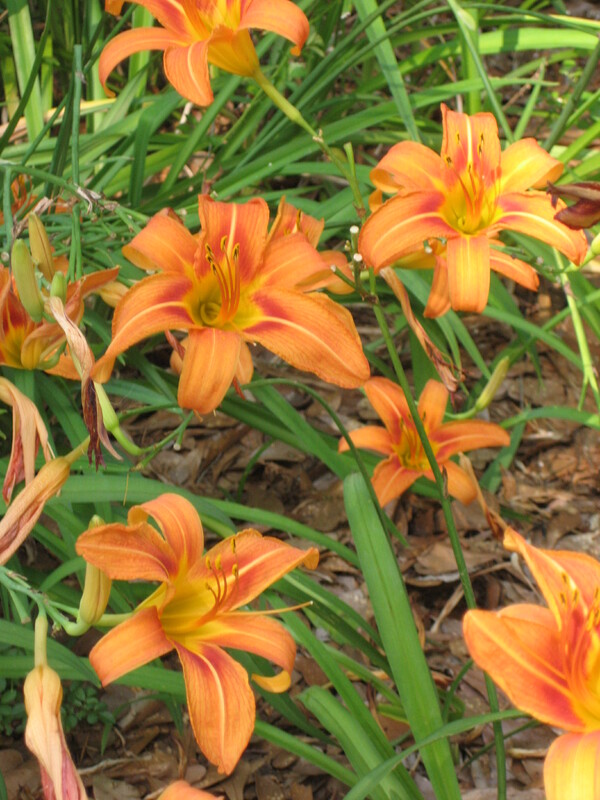 A great mainstay for the southern summer garden, Old Orange-as I affectionately call this daylily- is heat and drought resistant, and very easy to grow. They have multiplied, and bloom profusely during the late spring and summer each year, providing a tangible reminder of my ancestors who gardened before me. I found an itunes playmix on a blog I follow and I thought it would be fun to do for my blog. Click on the title for the playmix and then the title of the song you would like to hear. See what you think. Play gardening music as you weed or plan your garden- good for inspiration and relaxation! Share your thoughts. My mother was an indoor gardener, a lover and collector of houseplants. During high school, my mother gave me my first houseplant, a Crassula ovata, or jade plant, as she must have known I needed a succulent- low maintenance. When I left for college I was growing a Philodendran cordatum, or Heart-leaf Philodendron, so long it was trailing up and along the window molding and around the closet door frame. I, also, had a small collection of African violets and, of course, my jade plant. Even though mom was never tolerant of our southern heat and humidity, she would fondly reminisce about her mother’s Alabama flower garden. Mom’s favorite flower that her mother grew was Convallaria majalis ‘Bordeaux’ or Lily of the Valley. I think it was these coversations with her that gave me the deep connection I have with flowers, gardening, and people. 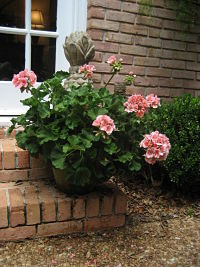 This morning my salmon colored Pelargonium x hortorum, or geraniums, spoke to me, reminding me of a fun time in my life. For about ten years every March around the second week, my mother-in-law would come to visit. It was her birthday week and she would come to celebrate it with our family. 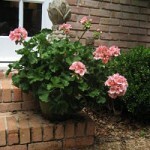 Anna would arrive between three and four o’clock in the afternoon with the back of her stationwagon loaded with huge salmon colored geraniums. Sweet joy! My heart would sing with the rejuvenating new life of spring! 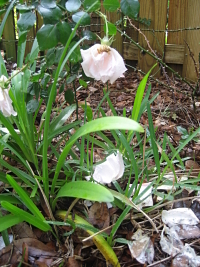 Being late winter, my lawn had not “greened-up” yet and my flower garden wasn’t in full swing, so to see those rich salmon, spherical, floral clusters so boldly shooting out from the ruffled edged, deep green, round leaves was sheer exuberance for me! Her annual birthday visit always heralded in spring a week early! What gardening, flower, or nature connections do you have with your mother? Please share. I’m always a little hesitant or woeful about traveling this time of year because of what I might miss blooming in my garden. Although I had a wonderful excursion to San Antonio for my best friend’s wedding celebration, I knew I would miss the peak blooming days of the New Dawn climbing rose and the Daisy Gardenias in my backyard. I returned yesterday afternoon and what was left of the roses was beaten off by a much needed torrential rain storm. I’m sad I missed them blooming, but the rain made everything else come alive with color and energy. It won’t be long before my agapanthus, daylilies, and hydrangeas bloom- so there’s always something to look forward to in the garden. As I’m writing this, my friend Paula is photograghing my garden. She has a wonderful eye and I can’t wait to see what she has done! I’ve referenced her blog in my favorites so please check it out and see how gifted she is with the camera. I’ll post some of her work later.